Detailed guide to 800km trek along the Franco-Spanish border, from Hendaye to Banyuls-sur-Mer. The unwaymarked route is described in 45 days, with 500 GPS waymarks, information on villages, mountain huts, guesthouses, hotels and campsites and variant routes to avoid difficult sections. 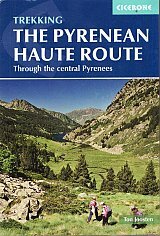 Also ascents of ten classic Pyrenean summits beside the route.